What Is The Louisiana Family Forum? They’re considered one of the most influential lobbying organizations in the State of Louisiana. On their website and their Facebook page, they’re upfront about their true mission: Influencing legislators and legislation. They publish an annual legislative scorecard, and every year, they host a lavish dinner for selected legislators, doling out awards and commendations. And every year, they raise and then spend hundreds of thousands of dollars in tax-deductible donations. 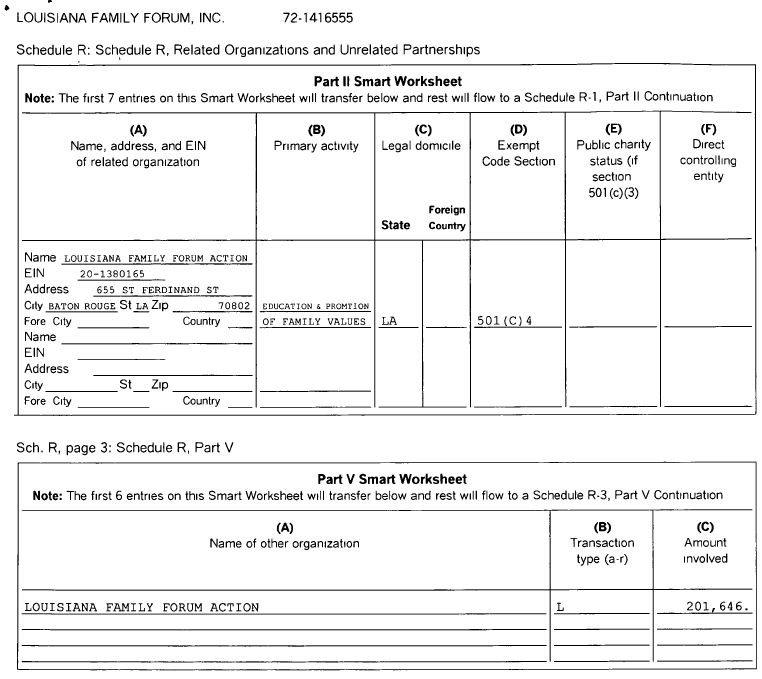 The Louisiana Family Forum may, on its surface, appear to be nothing more than a powerful lobbying group that represents the interests of far-right Christian conservatives, but officially, the Louisiana Family Forum is organized as both a 501c3 and a 501c4. The 501c3 is the money-maker, the Louisiana Family Forum (LFF), the tax-deductible half of the organization. But because it’s a 501c3, the LFF is limited by how much money it can spend on lobbying. Thankfully, there’s an easy way around this problem. The other half of the organization is the Louisiana Family Forum Action (LFFA), their 501c4. LFFA is still tax-exempt, but, because it can spend as much as it wants on lobbying, there are no tax-deductible donations. It’s an important distinction. Organizations may, however, involve themselves in issues of public policy without the activity being considered as lobbying. For example, organizations may conduct educational meetings, prepare and distribute educational materials, or otherwise consider public policy issues in an educational manner without jeopardizing their tax-exempt status. The Louisiana Family Forum, the 501c3 half, defines itself to the IRS as an educational organization. Their mission is simply stated, “Education and Promotion of Family Values.” According to their most recent 990 report, the LFF has spent hundreds of thousands of dollars every year for several years on salaries and “consulting” services (also listed as “Other” under “Fees for Services”). It spends tens of thousands of dollars every year on travel costs. Despite this, though, it only itemized $35,628 in lobbying expenditures in 2009. 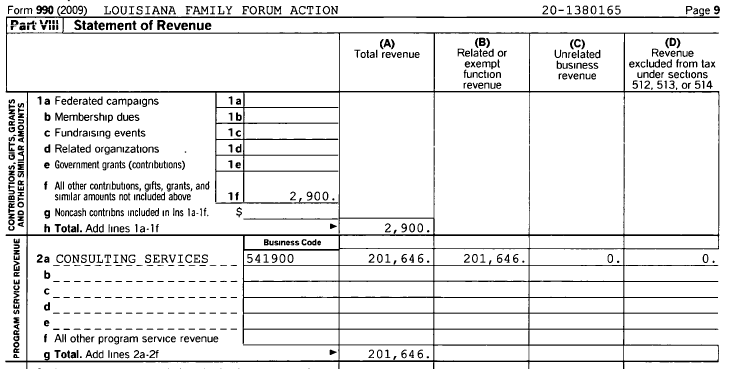 At the same time, the LFF funneled $201,646 to Louisiana Family Forum Action, their 501c4. 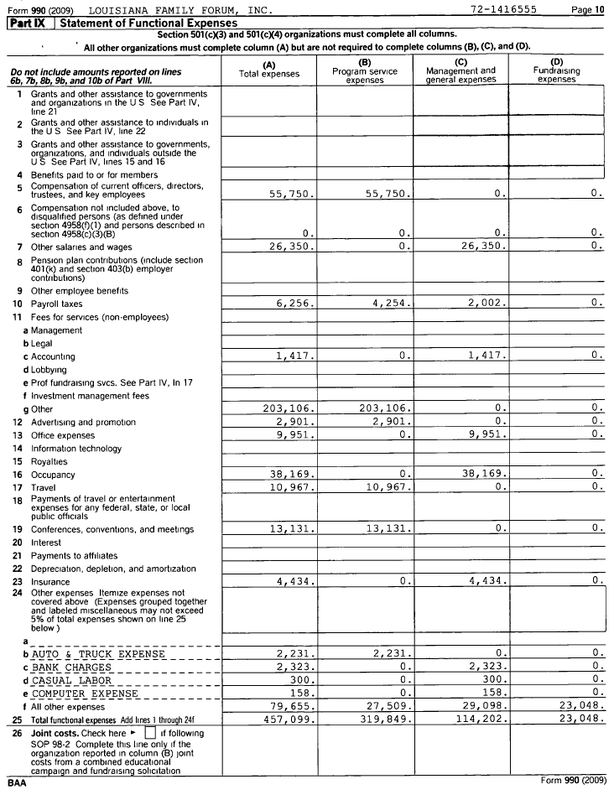 The LFFA’s total revenue in 2009 was $204,546. Interestingly, $201,646, the exact amount transferred by the LFF, is itemized as by the LFFA as “consulting” services. To be clear, I believe the only reason the LFF would create the LFFA, a separately organized and legally distinct off-shoot, is because they recognized a 501c4 better allows them to lobby. Suffice it to say that if no more than five to ten percent of an organization’s total efforts are devoted to lobbying, it is probably acting within legal limits. Many organizations shy away from activities they presume to be lobbying but which in fact fall outside of the definition of lobbying, which is narrowly defined by the IRS. Generally speaking, lobbying is the expression of a view or a call to action on specific legislation. Lobbying does not include, for instance, nonpartisan analysis of legislation, the expression of a position on issues (as opposed to legislation) of public concern, or action taken in “self-defense” of the organization. If more than an insubstantial amount of an organization’s resources are devoted to lobbying, the organization may wish to choose what is called a 501(h) election. This allows the organization to expend up to approximately 20% of its funds on lobbying. If you wish to lobby more than that, you might want to consider establishing a separate 501(c)(4) tax-exempt organization specifically for the purposes of advocacy and lobbying. The main difference between 501(c)(3) and (c)(4) organizations is that contributions to the latter are not tax-deductible. The U.S. tax code makes special provision for non-profit groups which are, once approved by the Internal Revenue Service, exempt from paying income tax. However, whether contributions by individuals can be claimed as a deduction against personal income tax depends on whether the organisation is registered as a non-profit group under section 501c(3) or 501c(4) of the tax code. Contributions to a 501(c)(3) organization can be claimed against income tax but donations to a 501(c)(4) entity cannot. While 501(c)(3) groups – which range from religious organizations, traditional service provision charities through to advocacy organisations – are more attractive to individual donors, the tax code places restrictions on the amount of funds that can be spent on lobbying and bans funds being used on election campaigns. However, what constitutes lobbying – defined as urging a vote on legislation – and educational activities is one of gray zones that is constantly debated. From a fundraising point of view it is much harder to raise money for a 501(c)(4) group, because individual donors cannot deduct the contributions from their taxable income. However, such organizations are free to spend as much of their funds as they like lobbying on legislation. Often a non-profit groups will have two related entities – one a 501(c)(3) and another a 501(c)(4). Under the tax code provisions it is perfectly legal to transfer funds from a 501(c)(3) to a 501(c)(4)organisation. However, the restrictions on how funds are spent by the original 501(c)(3) carry over on the funds transferred to the 501(c)(4). It’s also worth noting that the LFF disclosed they spent $35,628 with the LFFA specifically for “lobbying expenses.” This begs the question: How much money did the LFFA state as lobbying expenses? Exactly zero dollars and zero cents, at least according to their most recent 990. Given the ways in which both the LFF and the LFFA vaguely describe their expenses, it’s difficult to determine what they’re buying with the hundreds of thousands of dollars they spend every year on consulting services and services for “non-employees.” In 2008, the LFF itemized over $123,000 as expenses related to its “newsletter;” the next year, the number shrank to less than $14,000. But what is clear, however, is that the Louisiana Family Forum is widely considered as a powerful and influential force in the Louisiana legislature. Just last week, at the invitation of Congressman Steve Scalise, Gene Mills, the LFF’s Executive Director, delivered the opening prayer for the United States Congress. Reverend Mills appears to be on a hot streak. While he was in Washington, D.C., his organization successfully prevented the repeal of the Louisiana Family Forum’s signature piece of legislation: the Louisiana Science Education Act. The Louisiana Family Forum, along with the Discovery Institute, a Seattle-based think tank that promotes “intelligent design,” wrote the Louisiana Science Education Act in 2008. It was then introduced by State Senator Ben Nevers, who publicly admitted that he was acting at the request of the LFF, and subsequently signed into law by Governor Bobby Jindal. Nevers, the current Chairman of the Senate Education Committee, does not have a bachelors degree; Jindal, on the other hand, has a degree in Biology from Brown University. Only a few years prior, in 2004, Dan Richey, the LFF’s “grassroots coordinator,” was hired to work on Senator David Vitter’s first campaign for the United States Senate. Vitter paid Richey over $17,000, and three years later, Vitter attempted to earmark $100,000 in federal funds so that the Louisiana Family Forum could draft model legislation for public school science education. At the time, the LFF, an organization with an overtly religious mission, made it clear: They wanted to allow the teaching of creationism and intelligent design in the science classroom. The earmark may have failed, but the LFF still pressed on. Last year, Richey, incidentally, was also paid handsomely as a “grassroots” consultant for Roger Villere’s campaign for Lieutenant Governor. Although he lost the election, Mr. Villere was and still is the Executive Director for the Louisiana Republican Party. If lobbying is, in fact, the “expression of a view or a call to action on specific legislation,” then what do you call it when a tax-exempt, tax-deductible organization actually writes the legislation? The Louisiana Science Education Act isn’t the only piece of “specific legislation” that the LFF has targeted. Two weeks ago, Gene Mills gloated that he was able to kill HB112, which would have better protected school children from bullying, by simply writing a floor note to the legislature. There’s a good reason we have laws that govern the ways in which tax-exempt, tax-deductible organizations can influence our democratic process, and there’s a good reason we also have laws that govern the activities of lobbyists. Subverting or skirting those laws, no matter who you are or how noble your cause may be, is never acceptable. Neither is using religion as camouflage. The Louisiana Family Forum may be led by a reverend, but it’s not a church. When Governor Jindal was elected, he vowed to ensure that Louisiana’s ethics laws met “the gold standard.” Although, ironically, Mr. Jindal has continued to push back against requirements for increased transparency in the Governor’s Office, he still signed into law a sweeping set of disclosure requirements for almost everyone else in the State who could, potentially, influence legislation, even volunteer members of local commissions. Yet an organization that is widely considered as one of the most powerful lobbying forces in the State, somehow, they can spend hundreds of thousands of dollars without actually disclosing what they’re buying. Shouldn’t this article be sent to Internal Revenue Service with a request that they investigate LFF and LFFA regarding tax deductibility? While you’re at it, tell them about Planned Parenthood. At least the LFF isn’t asking for taxpayer’s money directly…. Ace, the LFF HAS asked for the taxpayer’s money directly. Read the post. Sorry Lamar, I really just scanned it the first time. LFF should be free to draft model legislation all their own (as should any other group that cares to do so – the Klan, Black Panthers, Shriners, etc. ), but should not receive any taxpayer funds to do so. Issue advocacy is NOT the issue here. Any organization, whether it be the Klan, the LFF, Big Business, or women’s health organizations like Planned Parenthood has the right to talk to any branch of government to advocate for whatever they want. The issue is that it seems apparent that the LFF is funding their lobbying efforts with tax deductible funds they received from donors, which is a violation of U.S. law. Overt evil masquerading as piety. Situations like this are what disgust me the most about living in Louisiana. You, sir, are a golden God….and not the kind Gene Mills worships. This rocks, man. Thank you, thank you, thank you. I’ve been trying to figure out how to fight these clowns for two years and I never even thought to check their purse strings. If someone hasn’t already done it, please send link to Don Cazayoux. Let’s find out just how powerful Mills really is. Thanks Dambala. Surprisingly, it was all right there, in plain sight. I now have nine years worth of returns. It should also be made clear: The failed Vitter earmark was not the LFF’s first attempt at receiving taxpayer dollars to support their effort. In 1999, the LFF received an $89,000 grant from the Louisiana Governor’s Office to develop an abstinence education program. By the way, I’d be remiss if I didn’t say: Dambala, thank you, thank you, thank you! For those of you who don’t know, Dambala broke the story about the cozy and corrupt relationship between Greg Meffert, NOLA’s former Chief Technology Officer, and Mark St. Pierre, who co-owned a tech company that did business with the City of NOLA. Last week, a jury of his peers found Mr. St. Pierre guilty on 53 counts. And it all first surfaced on Dambala’s blog. Kudos to you, sir. Thanks, as we pat each other on the back :). I think this LFF issue is infinitely more important to the state than the local graft in N.O. Mills and the LFF are entirely too powerful; their tactics and apparent financial shenanigans need to be exposed. There are few voices in this state who will take these guys on….we need to turn up the heat on them. 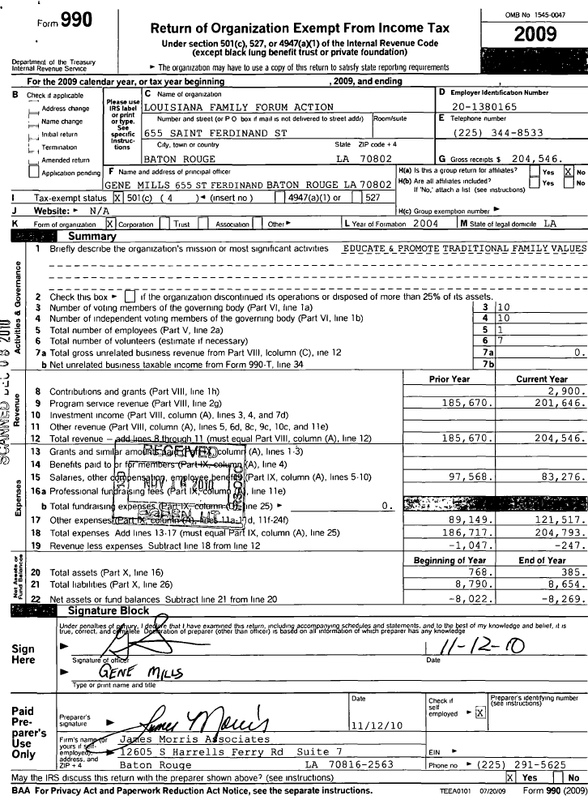 Maybe now you can look into Caroline Fayard’s campaign finance disclosure forms? OMG! Are you saying we have rotten politicians here in LA? Well, Duh! Seriously, as to the question about just how influentual LFF is, one legislator commented that LFF doesn’t just influence the legislature, it owns the legislature. Thanks for bringing this to the attention of others. F*ckin? tremendous issues here. I?m very happy to look your post. Thanks so much and i am taking a look forward to touch you. Will you please drop me a mail? All trace holidays to March 8!!! Revisiting this with the IRS “scandal” and all the outrage. Am I off-base or is this not the kind of thing the IRS is being criticized for investigating? The only way I could possibly be outraged by such a thing would be if they were ignoring similar *crimes* from more liberal groups. Why is everyone so quick to take the side of accused tax cheats? 8 людей из трёх стран: США, Росийской Федерации и Германии взяли участие в телепроекте «Doctor Life». Эти участники были отобраны среди большого количества других наркозависимых из нескольких стран мира. Автором идеи является профессор нарколог Женишбек Назаралиев. Заказчиком реалити-шоу стала антинаркотическая организация «Всемирная Лига “Разум вне наркотика”». Реалити-шоу показывалось в нескольких странах, в частности в России, а также в мировой сети Интернет на сайте http://www.doctorlife.tv . 7 из 8 героям реалити-шоу удалось избавиться от наркомании . Создателипроекта повстречались со всеми его участниками спустя год, с целью выяснить как поменялась их жизнь после завершения телешоу, что они испытывали, вернувшись домой, как они смогли адаптироваться. Как отмечает профессор, у всех героев телешоуотмечены улучшения отношений в семье, повысился уровень социального и трудового участия в обществе. О своей жизни после проекта участники повествуют в заключительной его серии «Год спустя». И хотя способы исцеления профессора поддаются серьёзной критике корпораций, ведущих фармакологический бизнес, благодаря психологическим установкам и стресс-энергетической психотерапии удалось добиться совершенного отказа от различных наркотиков. Методика нарколога в основном соотвентсвует требованиям постсоветской наркологической практики. Так, в Росийской Федерации матадоновая программа запрещена. Поэтому, без замещения, которое только снижает вред, профессор Назаралиев отменяет употребление опиатов сразу при поступлении пациентов в медицинский центр. Однако, усреднённый показатель годовой ремиссии при героиновой наркомании в Национальном научно-практическом центре наркологии Министерства здравоохранения России составляет 8%, а в трудовых коммунах – 15%. Сравнивая эти показатели с показателями метода профессора Назаралиева явно видно , что он требует к себе должного внимания. I want to show you our free warez WEBLED.EU !